Interdimensional Games' Consortium: The Tower Prophecy will fully expand on the original, according to Gregory & Steve MacMartin. 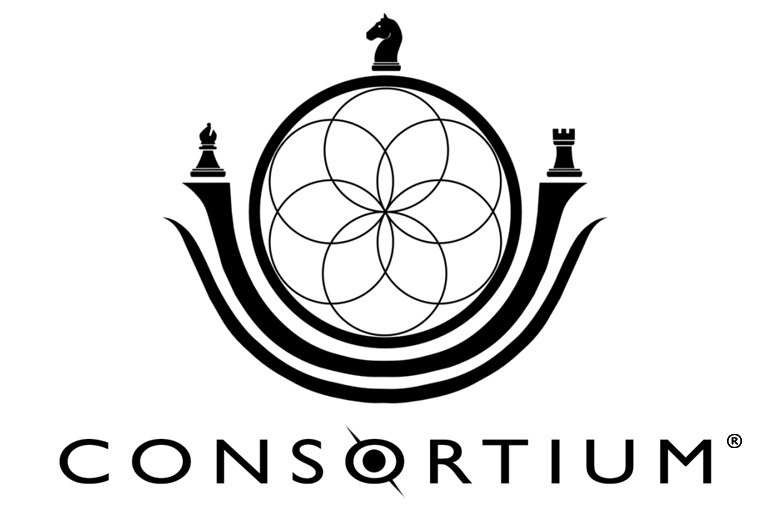 The original Consortium was a small-scale RPG with all kinds of big ideas. Set within the confines of a small, futuristic aircraft, it still offered the open-ended gameplay of titles like Deus Ex alongside clever metagaming twists comparable to The Stanley Parable. But it's also the first game in a planned trilogy, which means Interdimensional Games wants to aim even higher for its sequels. 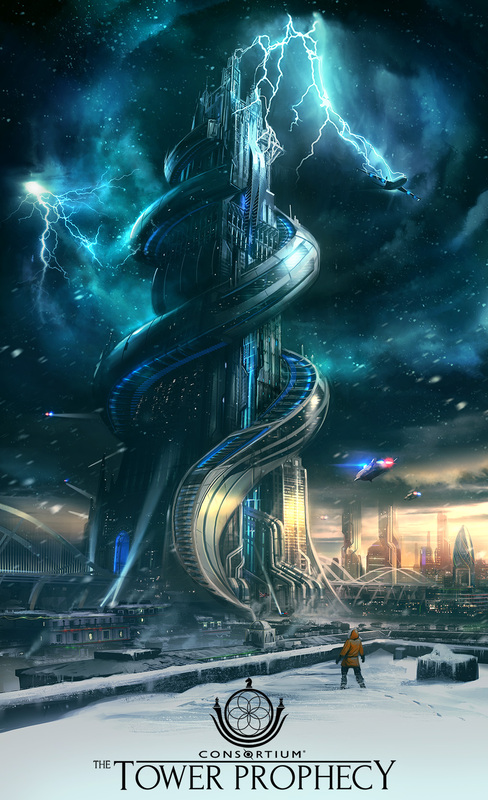 While still in its early stages, Consortium: The Tower Prophecy hopes to expand on the original's mechanics and world, while still offering unique experiences for every player. Consortium is set in a possible future timeline where humanity has achieved almost all of its goals along a path to world peace. The player controls Bishop Six, a Consortium operative helping maintain order against the few legitimate threats to order and stability. But the twist is you're still not Bishop Six - you are yourself, inserted into Consortium's universe from the real world through your computer interface. What's more, the Consortium's enemies know it, and are fighting to stop whatever future this intruder is creating. That made Consortium a far more self-aware experience than most RPGs, which lead designer Gregory MacMartin and his scriptwriting brother Steve MacMartin hope to build on in The Tower Prophecy. "From a pure story point of view, Consortium is about the possibilities of traveling to a future, alternate version of Earth and taking full control over another human being against his will," Steve told The Escapist. "Moral implications aside, the person being controlled, Bishop Six, it seems is smack in the middle of a global conspiracy where multiple factions strive for his attention. With complete agency, it's up to our world to determine which faction we can trust and choose to follow." Consortium: The Tower Prophecy picks up precisely where the first game left off - with Bishop Six skydiving into a hostage situation at Churchill Tower. "It's a truly massive futuristic skyscraper, almost a kilometer tall, and at its base it literally spans the width of the River Thames in London, England," Greg said. "We are leveraging all of the game mechanics, gear and characters that we invented with the first game and making use of them in a space that's a couple orders of magnitude larger than ZENLIL's interior." That means all of Consortium's gameplay - including forging positive and negative relationships with NPCs and finding multiple solutions to obstacles - will make their way into the new game. 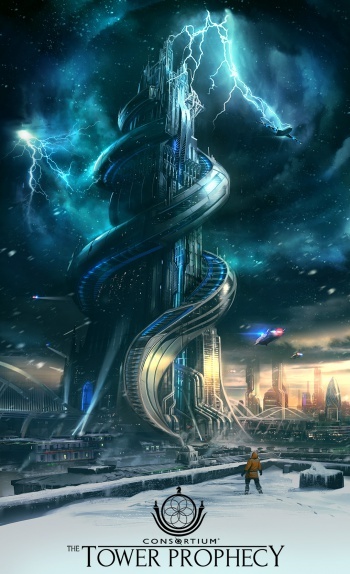 At the same time, The Tower Prophecy will be expanding certain mechanics to fit the larger setting, while implementing new gameplay elements altogether. 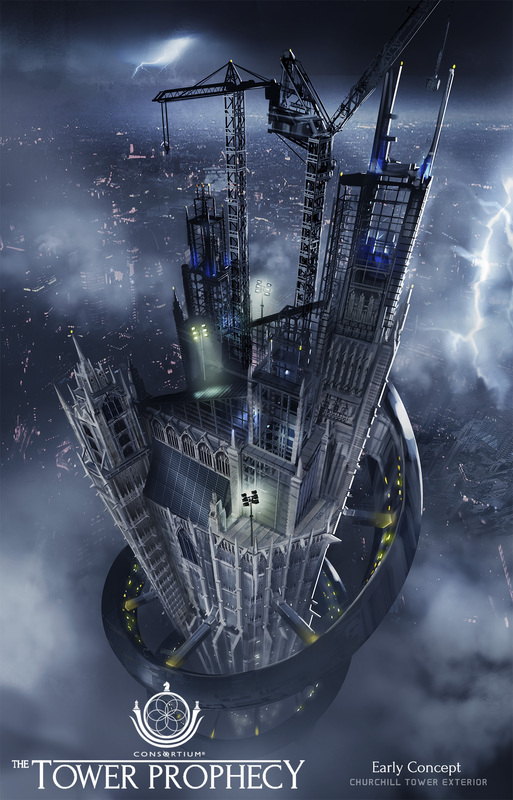 "Exploring will play a much larger role in this game, as players will have the chance to explore the Churchill Tower in a non-linear fashion," Greg confirmed, "making great use of the abilities that Consortium Bishop gear allows for such as super jumping, gliding and landing safely from great heights." One important element iDGi will expand is Consortium's combat system, which was incredibly complex considering the small of number of fights you could actually engage in. Not only will players have far more combat opportunities, iDGi will implement new crafting mechanics that let you customize gear in the field, unlocking a wide array of combat approaches. "This will easily be the largest difference between the first and second games," Greg said. "We're envisioning a multitude of possible combat scenarios that could unfold based on where players go and what they do. The A.I we developed for Consortium that allows for combatants to flee, surrender and take cover will be further refined and also allowed to fully shine in much larger and more complex environments. All of this combat, and how the player resolves it, will directly impact the story itself." That's not to say players have to rely on combat alone. The upgrade system above includes stealth upgrades for sneaking past enemies, or you use diplomacy to avoid combat entirely. "Players who never even so much as pulled out their weapon in Game One will still be able to interact their way through this game's story without resorting to violence, it will only be more challenging to do so," Greg explained. "Diplomacy, tact, clever exploration and stealth will play a very key role for those players who prefer to find ways other than blasting through every situation." Speaking of Game One, The Tower Prophecy will allow players to import their Consortium save files when starting the game. This allows The Tower Prophecy to carry over in-game decisions and any relationships Bishop Six nurtured into the sequel. Even though Knight 15 and the Rooks are still on the Zenlil aircraft, you'll be in contact with them through the Consortium Mind Communicator, picking up connections right where they left off. What's more, players can build alliances with all-new characters, including enemies of the Consortium if they choose. "The Tower Prophecy will introduce at least a dozen new characters of varying importance," Greg told us. "In particular players will have a chance to explore relationships with people outside of the Consortium, including getting involved with those vehemently opposed to the Consortium and what it stands for." That's promising for fans of Consortium, but iDGi hasn't forgotten about newcomers either. The Tower Prophecy is planned as a standalone experience where new players can fully grasp what's happening. What exactly that entails isn't clear (especially since Consortium ended in a cliffhanger), but Greg assured us that plans are in motion. "We're developing a number of really cool ways to introduce the game-world and story to brand new players that never played the first one," Greg said. "The Tower Prophecy game will welcome new players with open arms, as it's very important to us that players not have to play the first game to be thoroughly immersed in this one. Of course, those players that do continue their saved universe from Consortium will not be disappointed." If you're a Consortium fan, odds are all of this news should be very exciting. Sadly, there's no release date to look forward to just yet, but iDGi is considering a follow-up crowdfunding campaign this year. At that point, we'll have a better idea of when The Tower Prophecy will be released and what its gameplay will look like.